The volcano field at Grants extended for several miles along I-40. In places there were small craters so it must have been pretty exciting 3,000 years ago. I learned a lot more about Route 66 today. Just because you see a sign for Historic Route 66 don't take it. About 32 miles on I-40 from Albuquerque I decided to try Route 66. We headed south and wound up in Los Lunas, 32 miles from Alburquerque. Route 66 then went through Alburquerque and all the way up to Santa Fe before returning to today's I-40. I checked out a Route 66 website which had a map of the remaining parts of the Route. The first one I wanted to take wound up a dead end with no access to I-40. Another stretch had 17 miles of gravel. It is safe, however, to take it through the towns. We are staying in Tucumcari because it was the inspiration for the movie Cars and I thought it was neat on our 1987 trip. It is very sad to see all the gas stations, motels and restaurants closed down along the main street, Route 66. The Blue Swallow Motel with its Refrigerated Air at least had a sense of humor with the painted wall on the back of the rooms. (see photo). The street was very wide and at times there was no traffic at all. 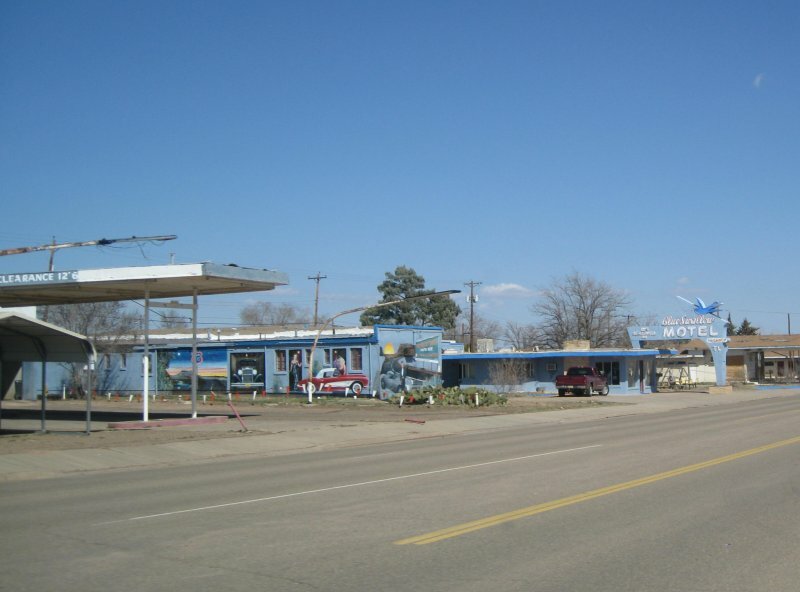 The Economic Developers have a real challenge at Tucumcari. The name comes from a legend about the old Apache Chief whose daughter, Kari, had two suitors. One she loved, Tocom the other she hated. The Chief told the two braves they would have to fight to the death for her hand. The daughter entered the frey and killed the winner with her knife. When the Chief learned the outcome he grabbed Kari's knife and killed himself crying in agony Tocom-Kari (which evolved to Tucumcari. I thought we had seen the last of the snow at Flagstaff, but for 20 miles after Albuquerque the fields were covered in snow.